All donations to our crowdfunding campaign will be TRIPLED through December 26 thanks to a generous private donor and a corporate sponsor! During these ‘12 Days of MealFlour’, check this page everyday to see what your donation will support as we share highlights from our programs. Its DAY 2 of the 12 Days of MealFlour where all donations are TRIPLED! In order to test mealworm farming in a variety of climates, we worked with our partner organization, PEILE, to train a family in the region of Retalhuleu on the coast of Guatemala. We worked with the whole family in San Martin to figure out the best way to adapt mealworm farming to the warm, humid climate. Through this collaboration, we found that in these areas, it is better to have a more open farm structure, and the mealworms do better when fed wheat flour instead of oats. Your donation will support our efforts to continue researching and innovating new ways to grow mealworms! Mealworm farming is easy and simple! Farms can be made with a variety of different materials and set-ups. To find the best and most accessible farming method, MealFlour runs a large experiment using a variety of cheap and available materials in Guatemala. We’re excited to share the results of this work with you in 2018! Your donation will support our efforts to continue researching and innovating new ways to grow mealworms for protein. At MealFlour, we're committed to environmental sustainability. That's one of the many reasons we love mealworm farming (it's great for the environment!) and why in 2017 we partnered with local groups to find more ways to promote sustainable eating. In the city of Xela, we built a compost bin that we fill with waste from local restaurants. We've also been working with Jardineros Organicos, an organic urban farm in Xela. Your donation, which is TRIPLED during the 12 Days of MealFlour, will help us continue to promote mealworm farming and sustainable practices throughout Xela. Asociación de Mujeres Ixpiyakok (ADEMI, Ixpiyakok Women's Association) was started in 1984 by 30 indigenous Mayan women who lost their husbands in the civil war. Now, they work with over 30 communities throughout the Chimaltenango and Quiche regions to improve food security and nutrition, economic development, health, and political education. We are excited to work with ADEMI in 2018. We will be teaching ADEMI's "promotoras" (health promoters) how to raise mealworms and then help them set up training programs in their communities. These will be the first mealworm farming trainings conducted in Kaqchikel, one of the 22 Mayan languages spoken in Guatemala, and which is spoken by many communities in Chimaltenango and Quiche. Just 10$ is enough to buy the materials to start a farm! And until December 26th, all donations are TRIPLED! Asociación BPD (ALDEA) works in Chimaltenango on projects dedicated to increased production of nutritious foods, nutrition education, increased access to water and sanitation, reduction in indoor air pollution, increased access to family planning, empowerment of women, and empowerment of young people to improve their long-term health and that of the next generation. In 2018, MealFlour hopes to partner with Asociación BPD to run a train-the-trainer program, along with our program with ADEMI. With your donation, we’ll be able to bring MealFlour to Asociación BPD’s partner communities! 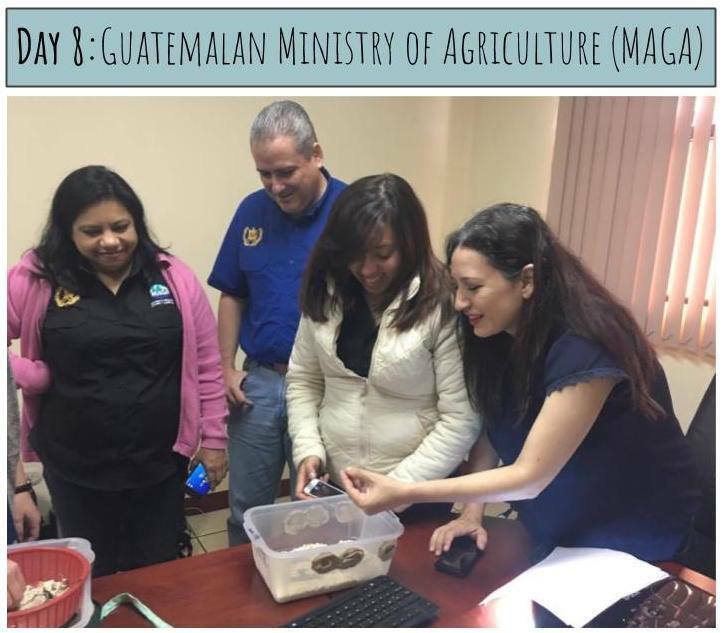 In August, MealFlour traveled to Guatemala City to meet with the Guatemalan Ministry of Agriculture (MAGA) and present our work. We discussed the environmental and nutritional benefits of mealworm farming, our program, and plans for the future. The government officials sampled mealworm cookies, learned about the farming process, and were very enthusiastic about the program. In the future, we hope to work with MAGA to hire a Masters student from the Universidad de San Carlos de Guatemala who will do their practicum with MealFlour. One way we teach people about mealworm farming is through our crash courses. Over the course of 3 sessions we go over the mealworm life-cycle, practice building farms together from upcycled materials and make a yummy protein-packed snack with mealworms. These pictures are from our crash courses last year with aspiring teachers in the western highlands of Guatemala. In 2016, MealFlour started to work with the organization, PEILE. This year, we built on this partnership by expanding to a second region of Guatemala, Huehuetenango (Huehue), and starting a locally lead mealworm farm experiment at their center. In Huehue, we worked with PEILE staff, teaching them the program and how to train other members of the community. The newly trained leaders hosted an open house with members of the community in Huehue, Malacatancito. Back in Xela, 7 women have taken the lead on a farm experiment, varying mealworm food with locally sourced grains. Look out for results to come. Only 6 more days to donate as part of our '12 Days of MealFlour', where all contributions are TRIPLED!